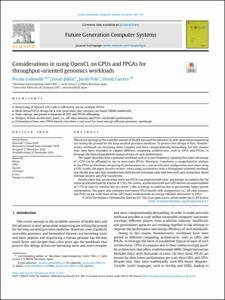 Cadenelli, N., Jaksic, Z., Polo, J., Carrera, D. Considerations in using OpenCL on GPUs and FPGAs for throughput-oriented genomics workloads. "Future generation computer systems", Maig 2019, vol. 94, p. 148-159.